When making a meringue it is important that the egg whites reach maximum volume. To ensure this, make sure that your mixing bowl and whisk are free of grease. Put the egg whites into the mixing bowl and beat using an electric whisk until they form soft peaks. Reduce the speed of the whisk and slowly add the sugar, tablespoon by tablespoon. The sugar needs to completely dissolve into the egg whites. You can check this by rubbing a little of the mixture between your thumb and index finger. If gritty it is not quite ready and needs further beating. When all the sugar has been incorporated, add the vanilla essence, cornflour and vinegar. This will give the pavlova a dry and crisp crust, with a marshmallow like centre. When ready, the mixture should be glossy. When the bowl is turned upside down the mixture should remain stationary in the bowl. Meanwhile prepare your baking tray. Line two oblong baking trays (13 x 9 inches) with parchment paper. Divide the mixture between the two. Be approximate and try to ensure that your base is larger than your top layer of meringue. You can use either a wooden spoon or a piping bag to spread the mixture out on the baking sheets. Bake in the oven for 1 hour until the meringue mixture is very firm to touch but still soft in the middle. I normally leave mine to cool in the oven with the door ajar. When cold, transfer to a serving platter and decorate with some freshly whipped cream. Pile the strawberries on top of the cream. Repeat this process to create a double layered pavlova. Does SuperValu sell the meringue bases? Like the meringue nest that sell in a box? 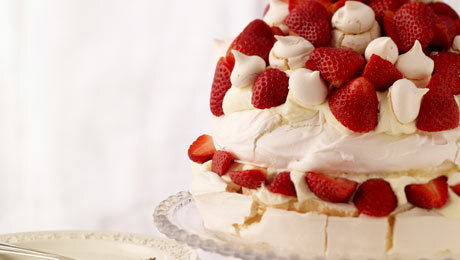 Hi Mary, We do sell SuperValu Pavlova which is a large meringue base, sold one per pack. Hope that helps!